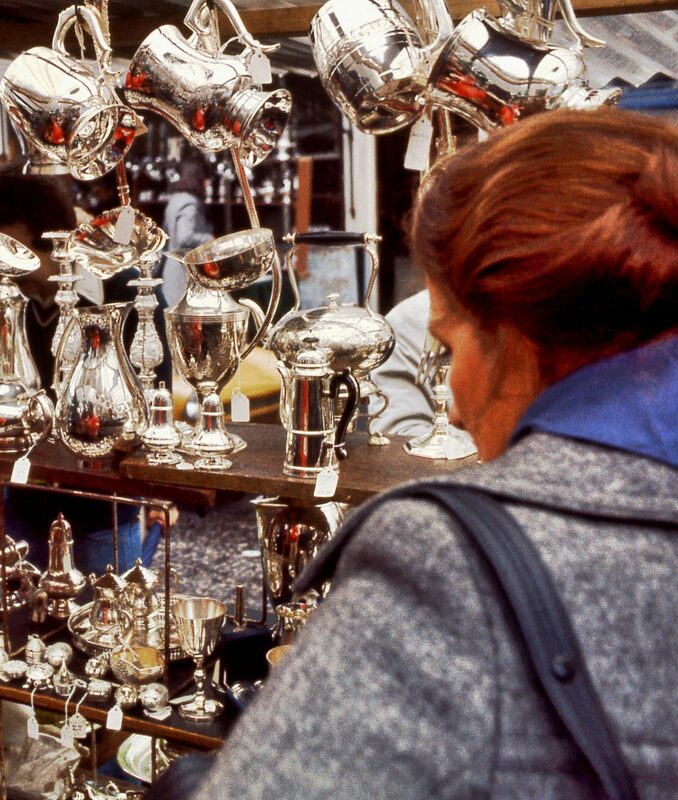 ← Don’t Lose Your Mind! 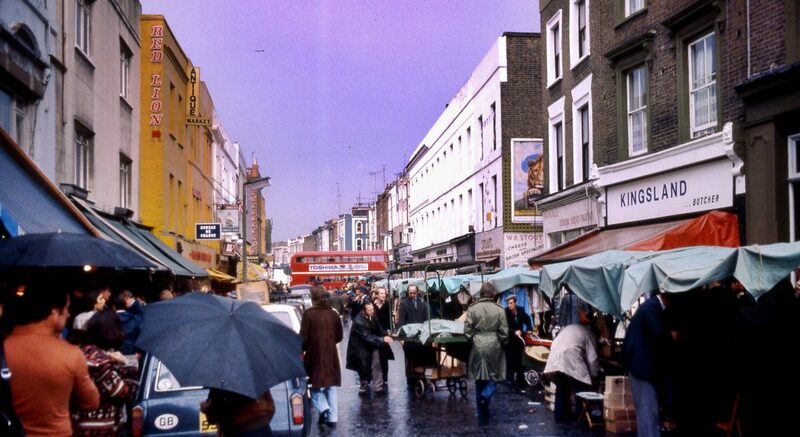 Portobello Road is a construction of the Victorian era. 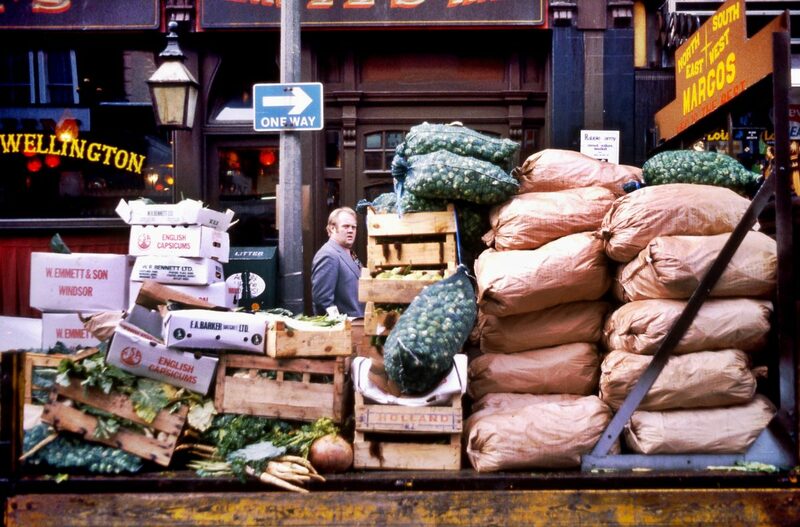 Before about 1850 it still consisted mostly of hayfields, orchards and other open land. 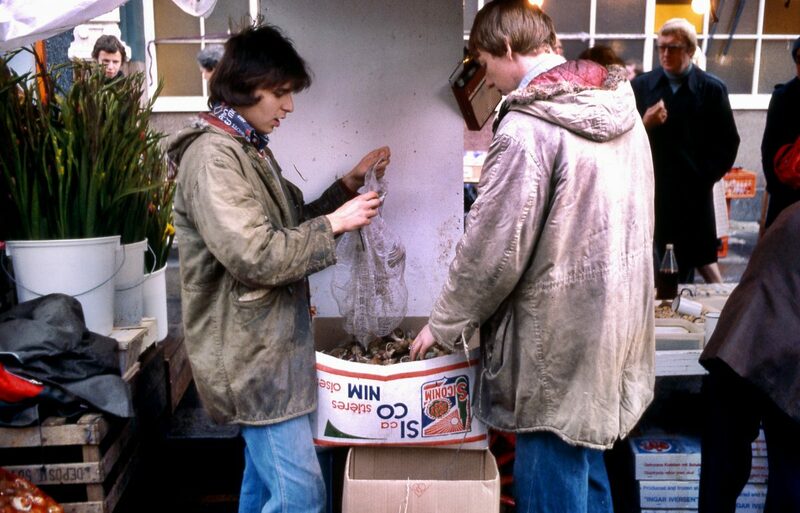 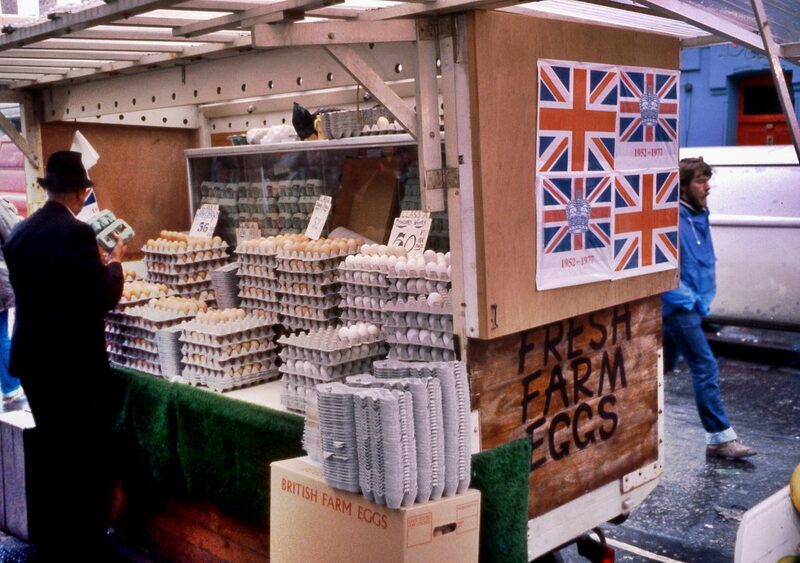 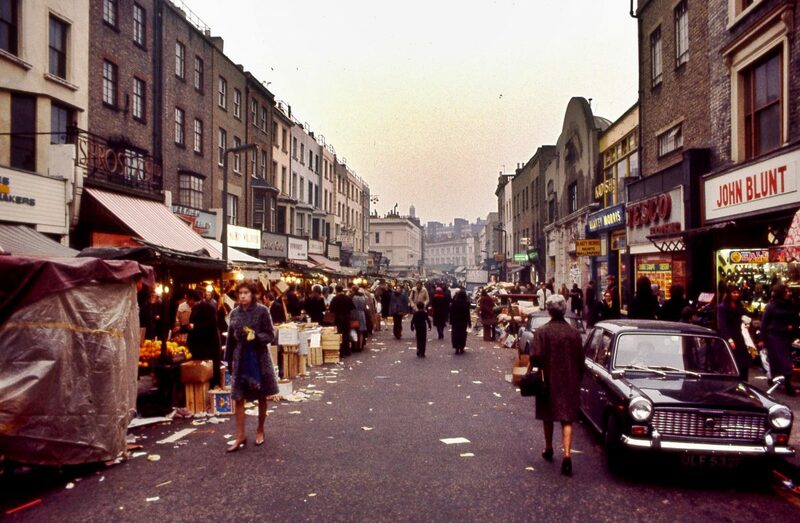 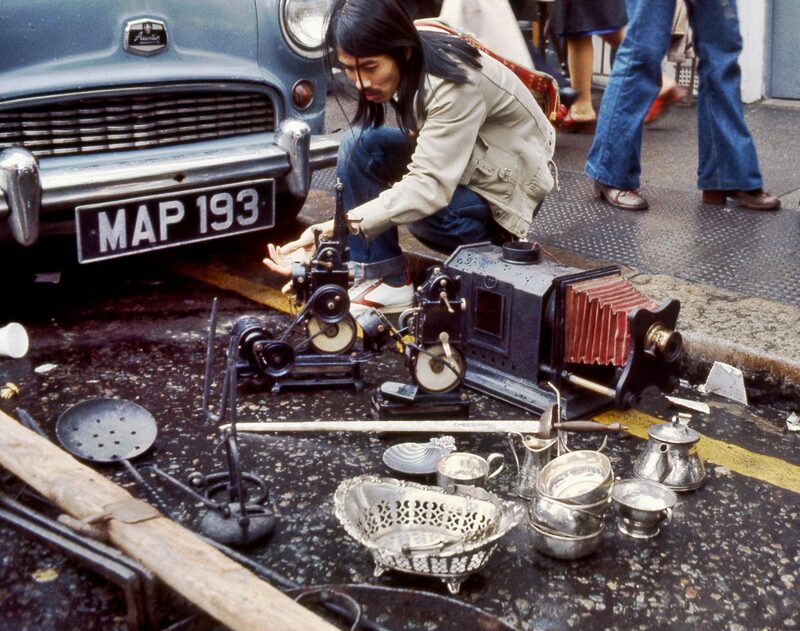 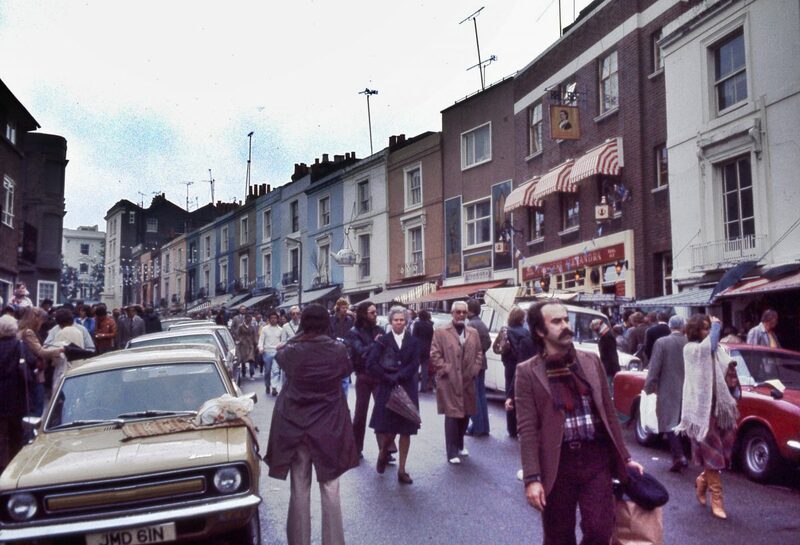 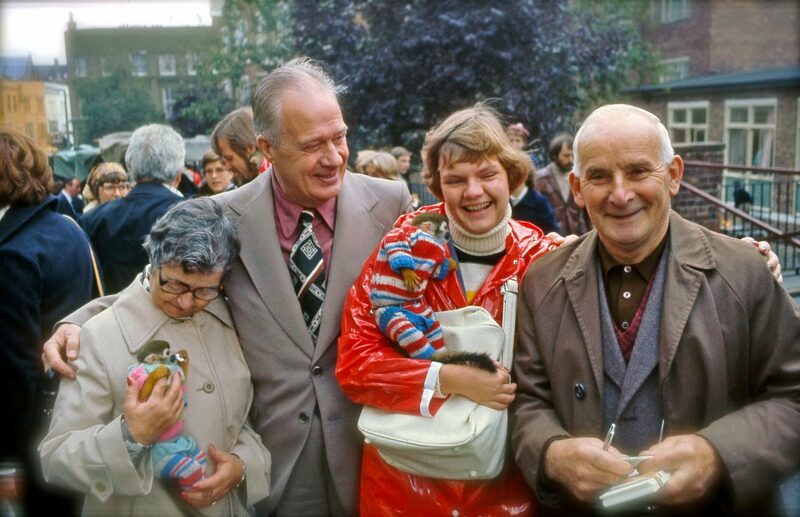 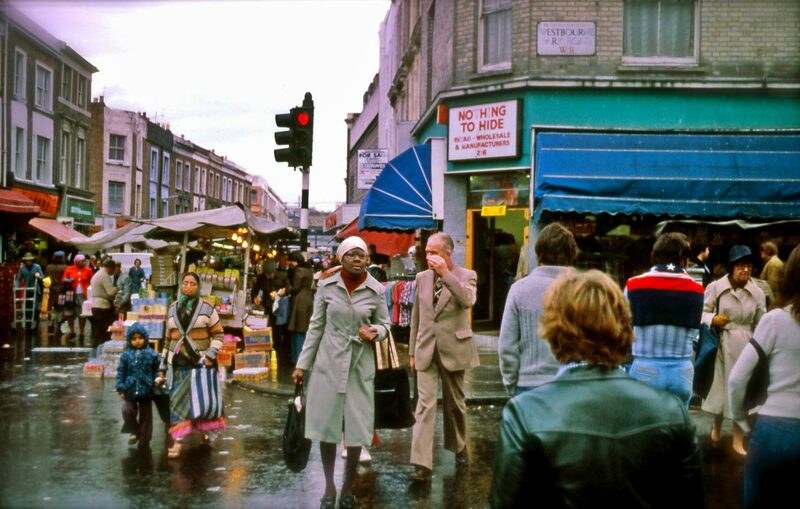 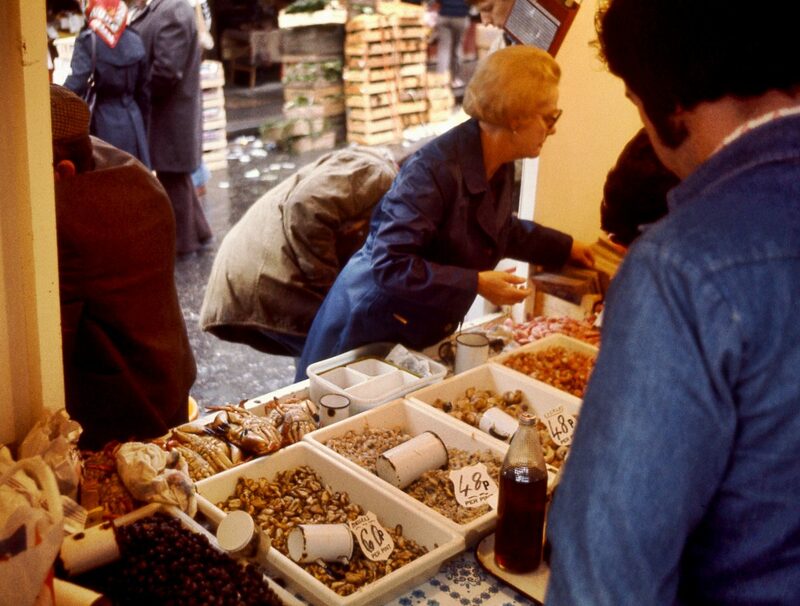 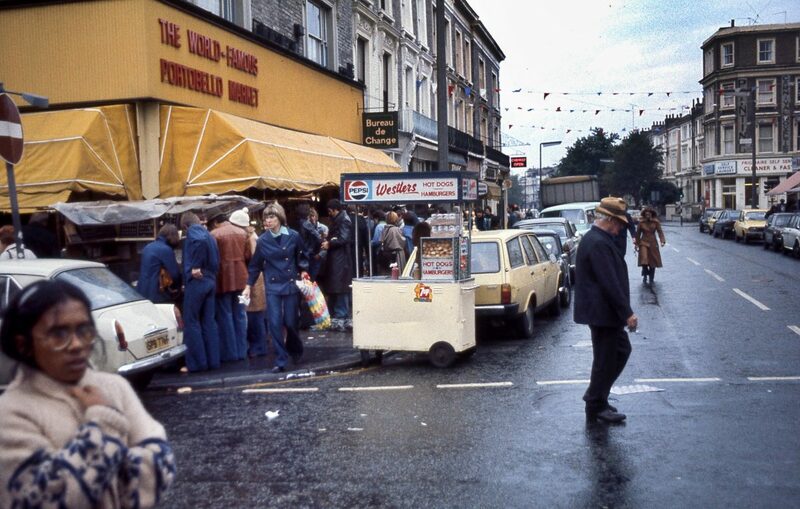 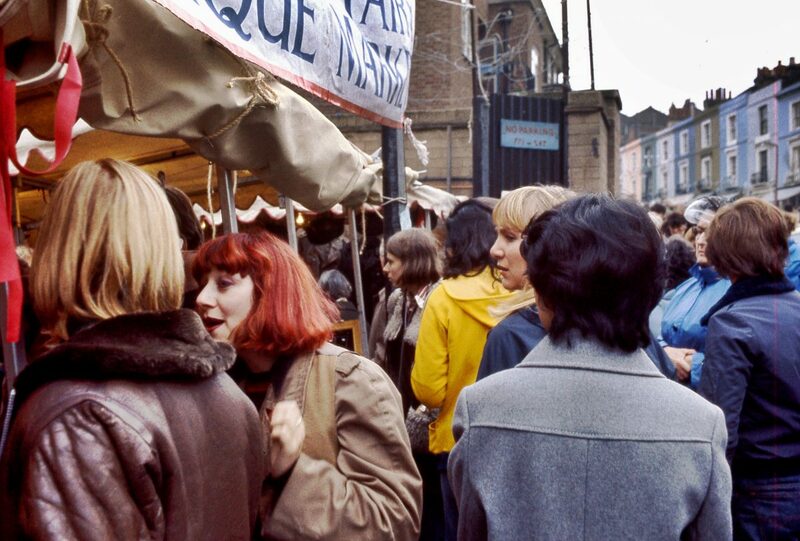 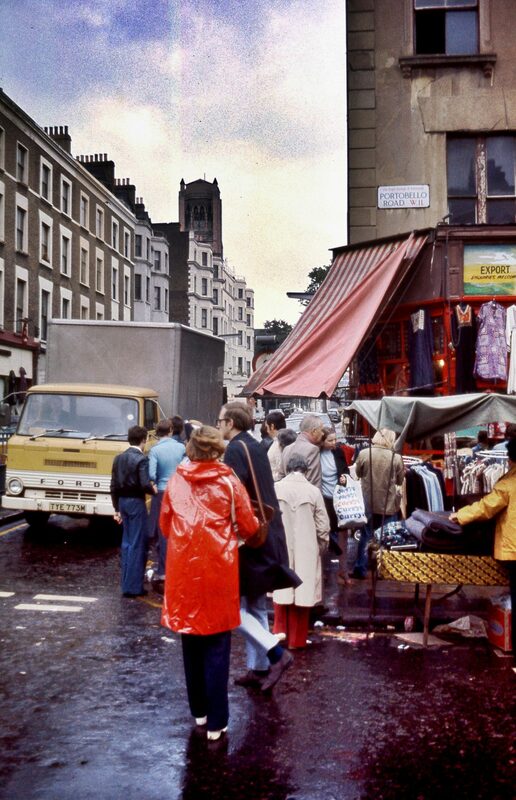 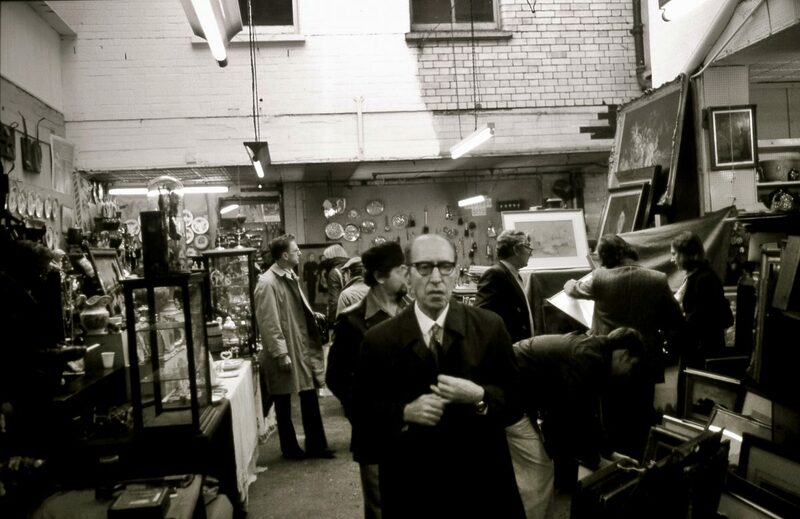 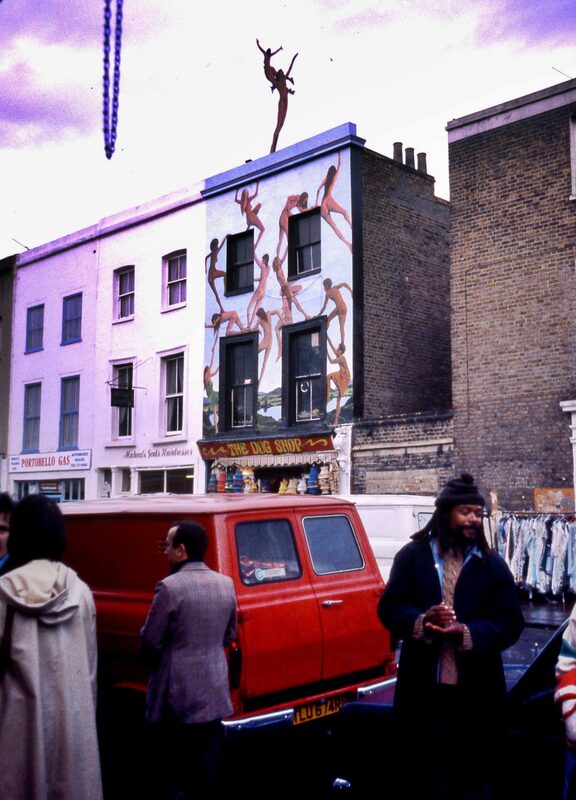 These photos of Portobello Road were taken in 1977 by Swedish tourist Mats Örn. 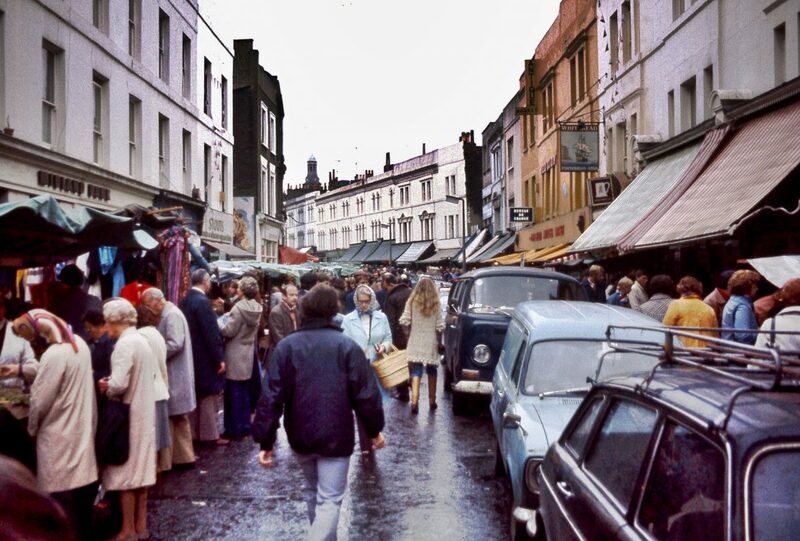 Portobello Road was originally known as Green’s Lane – which was nothing more than a country path that ran from the Kensington Gravel Pits, (situated where Notting Hill Gate is now) up to Kensal Green in the north. 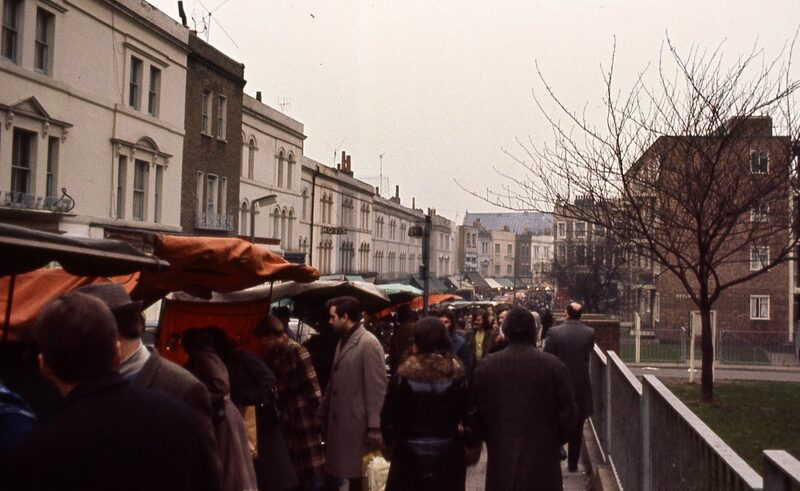 In 1740, Portobello Farm was built in the area near what is now Golborne Road. 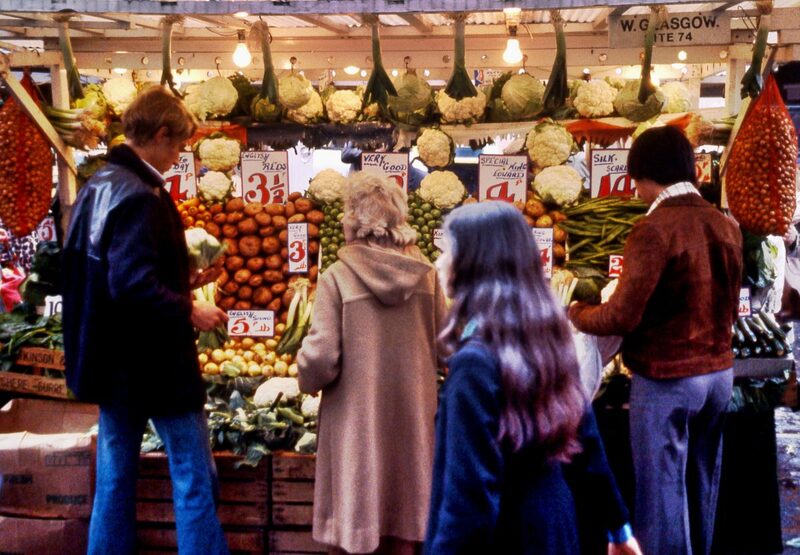 The farm got its name from a popular victory during the War of Jenkins’ Ear, when Admiral Edward Vernon captured the Spanish-ruled town of Puerto Bello (now known as Portobelo in modern-day Panama). 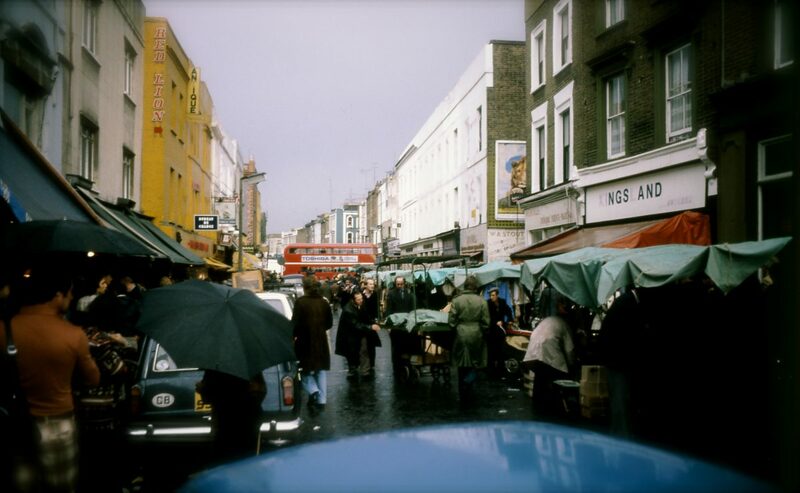 Portobello Road is a construction of the Victorian era. 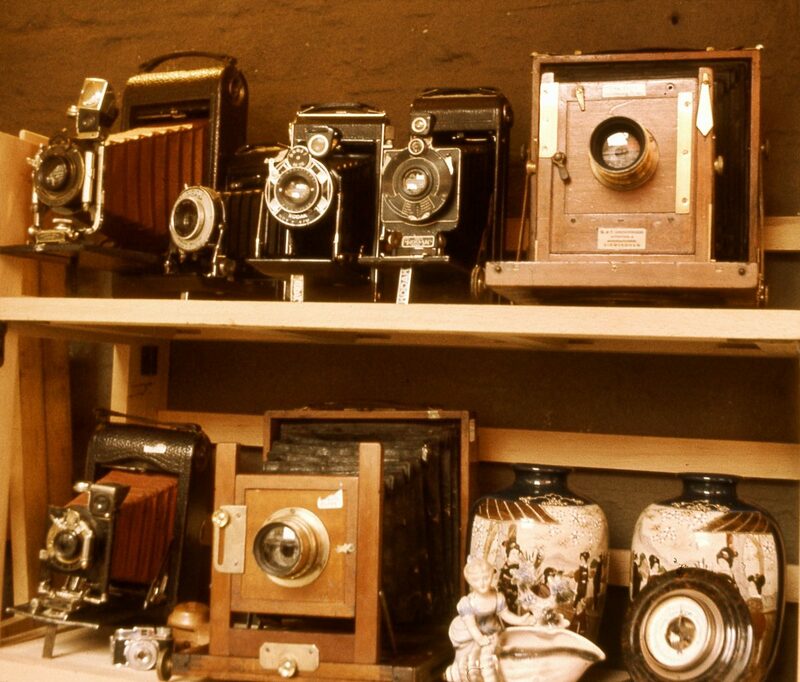 Before about 1850 it still consisted mostly of hayfields, orchards and other open land. 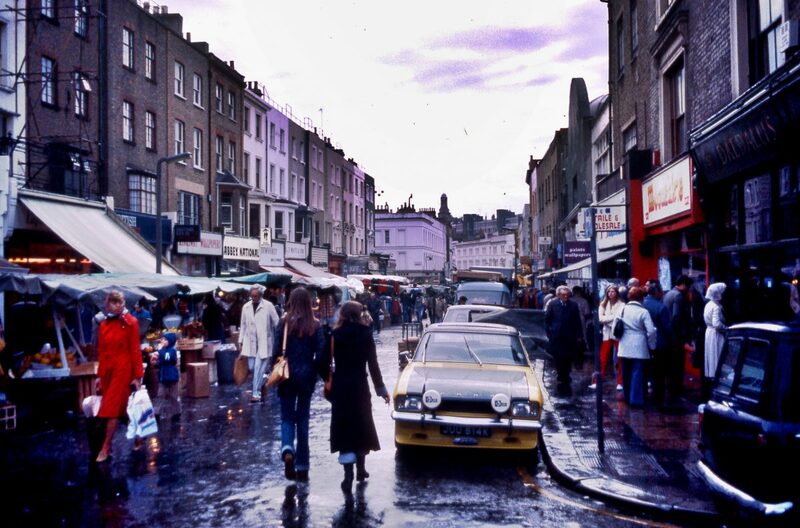 The road ultimately took form piecemeal in the second half of the 19th century, nestling between the large new residential developments of Paddington and Notting Hill. 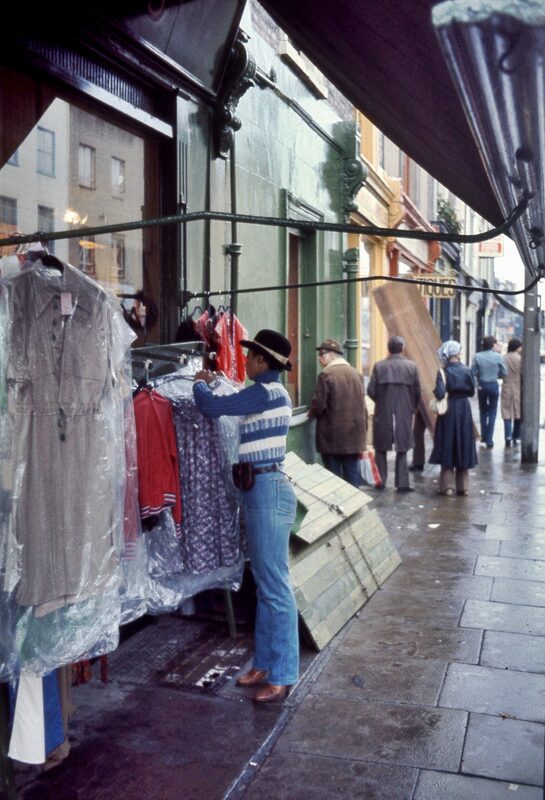 Its shops and markets thrived on serving the wealthy inhabitants of the elegant crescents and terraces that sprang up around it, and its working class residents found employment in the immediate vicinity as construction workers, domestic servants, coachmen, messengers, tradesmen and costermongers. 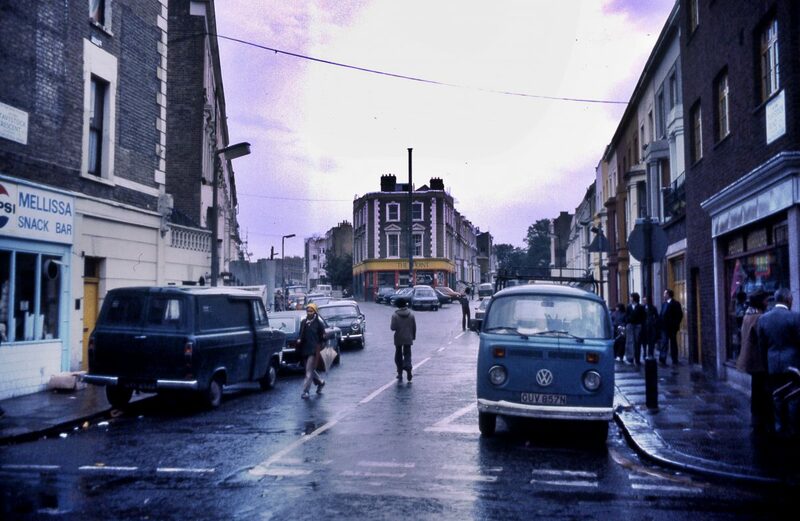 After the Hammersmith and City Railway line was completed in 1864, and Ladbroke Grove station opened, the northern end of Portobello Road was also developed, and the last of the open fields disappeared under brick and concrete. 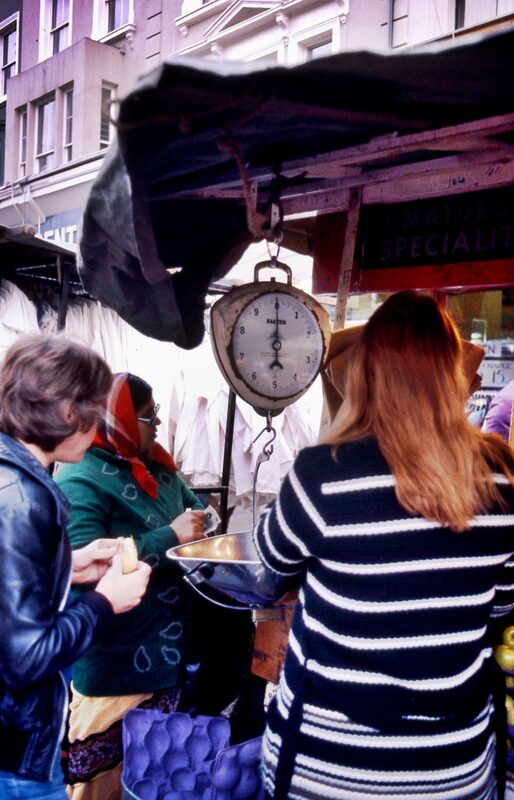 The market began as many other London market and mainly sold fresh-food in the 19th century; antiques and wares dealers arrived in the late 1940s and ’50s, and gradually antiques have become the very main attraction of this market, having a substantial number of them trading mainly on Saturday mornings. 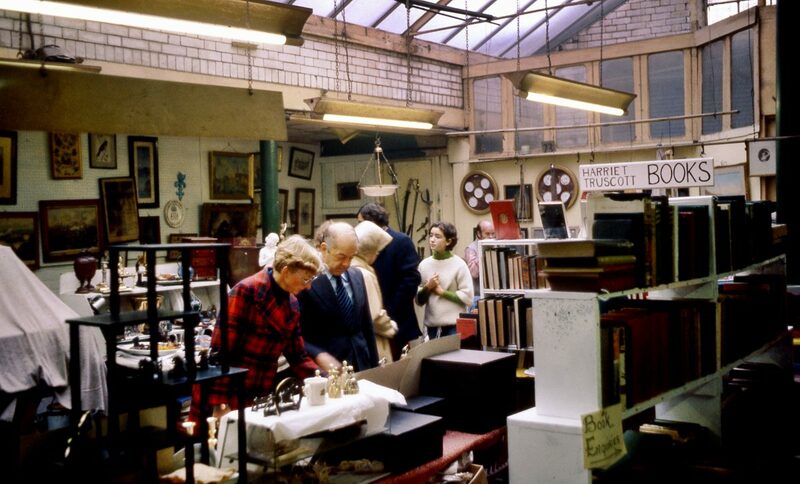 It is the largest antiques market in the UK. 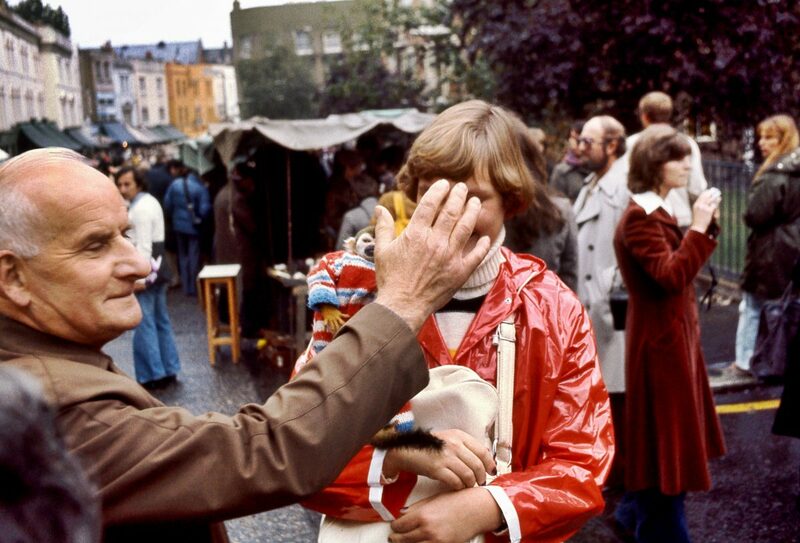 Many more of Mats Örn’s photos can be seen at his Flickr collection. 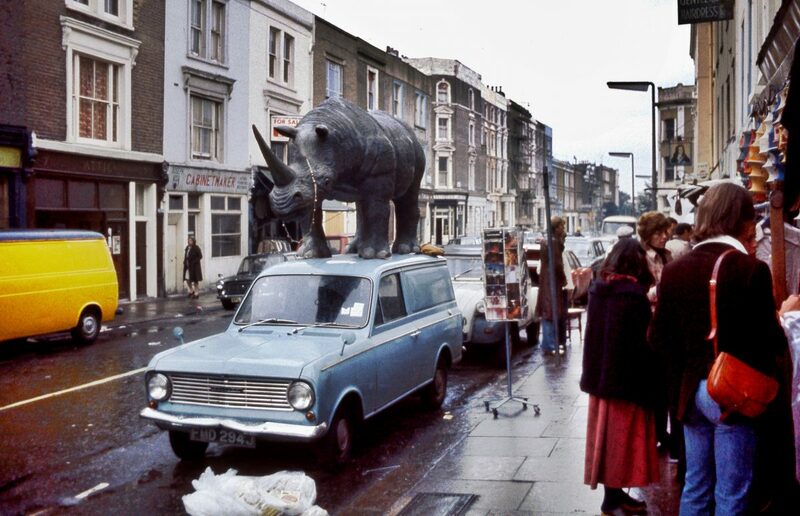 The first photo – with Rhino – was taken outside The Dog Shop on Blenheim Crescent, looking towards Kensington Park Road.